Member of Wilson Grammar School Band, Fortier High School Band and Tulane University Band. Member of Police Concert Band and N.O. Concert Band, all of which in New Orleans, La. Volunteered and served as a docent at the WWII Museum in New Orleans after retirement from the retail business. Born, raised and lived 75 yrs. in New Orleans until Hurricane Katrina struck when moved to Dallas, TX. William Mexic was born on December 31, 1929 and celebrated each birthday with New Year's Eve. William passed away on June 18th, 2018. He was 88 years old. He is predeceased by his parents, Harry and Adrienne Mexic and his loving wife of 53 years Lois Stillman Mexic who passed in 2011. He is survived by his sister Selma Raphael, two daughters Sheryl Mexic and Melanie Morris, son-in-law Jeffrey Morris and two grandchildren, Alexandra Morris and Mitchell Morris. Having grown up in New Orleans, his career started in the family business. He graduated from Tulane University and served as a commissioned officer in the U.S. Army. He was a docent at the WWII museum. 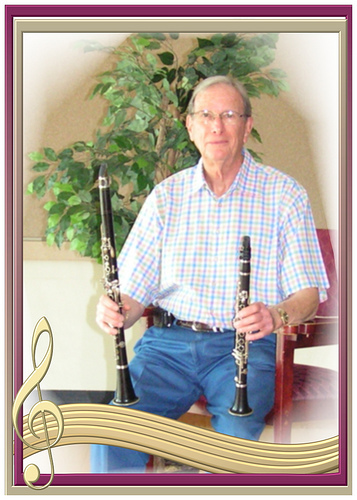 His lifelong hobby was playing clarinet as a member of two concert bands. He was a volunteer for Jewish Federation of Greater New Orleans and served on several boards, including the Jewish Children's Regional Service, Congregation Shir Chadash and Shearith Israel, and adocent for the New Orleans Public Schools. Bill relocated after Hurricane Katrina to Dallas. His favored interests include attending the Dallas Symphony and traveling. Recognition is given to May Sebel, my partner and love having mutual shared interest. Funeral Service will be held at 1pm on Wednesday, June 20, 2018 at Sparkman/Hillcrest Funeral Home, 7405 W. Northwest Highway, Dallas, with burial to follow in Hillcrest Memorial Park. Donations can be made to Lois S. and William Mexic Young Professionals Outreach Endowment Fund at Congregation Shearith Israel Dallas or Lois and William Mexic Endowment Fund at Jewish Family Service of Greater Dallas.